You are currently browsing articles tagged custom setting. I spent a considerable amount of time with both the Nikon D610 and the Nikon D600 as I researched and wrote my guides to the camera, Nikon D610 Experience and Nikon D600 Experience, and it has proven to be one of my favorite dSLR bodies. It is well designed, fully featured, and the image quality and low light performance has proved to be excellent. It is indeed a very powerful and versatile dSLR camera, and much of that is due to its autofocus system, its controls, and its custom settings. In fact, if you go through the Menus and Custom Settings of the D610 / D600, you will find that a “Top 25 Tips and Tricks” post could easily be put together from just these options alone. Below is an explanation or introduction to several of these features and options for the D610 / D600. I go into much more detail about using all of these particular functions and settings, as well as everything else about the camera, in my e-book user guides Nikon D610 Experience and Nikon D600 Experience. And in fact, some of the content from these books is excerpted or summarized throughout this post. Detail of the controls of the Nikon D600 dSLR camera. When capturing an image, it is essential that the image is sharp and that the camera focuses exactly where you want it to. So in order to focus on your desired subject, or precisely on – for example – your subject’s eye, you need to take full control of the AF system. The 39 AF points of the D610 / D600 will allow you to tell the camera exactly where you wish to focus, but the various configurations of Autofocus Modes and Autofocus AF-Area Modes may make it more of a challenge to learn initially. So I have written an entire post about making use of this AF system, which you can read here. It involves first learning the AF related controls and then setting up the applicable Custom Settings so that the AF system works as you want it to. (Some of these settings are especially important when using AF-C mode to track moving subjects.) You will then choose an Autofocus Mode (such as AF-S or AF-C) typically based on if the subject is still or moving, and an Autofocus AF-Area Mode (such as Single-Point or Dynamic-Area) typically based on how you wish for the camera to make use of surrounding AF Points such as to help focus on a subject or track a moving subject. Simulated view of the Nikon D610 / D600 Viewfinder, showing the locations of the 39 AF Points (all of the AF Points will not be visible in the viewfinder at the same time as seen here). The Menus and Custom Settings will also allow you to do things such as limit the number of available AF Points to just 11 if you find the 39 points excessive for your needs or overwhelming at first when learning to use them (a6: Number of focus points). And you can make use of another setting to dictate whether or not the focus point selection “wraps around” to the other side of the screen when you reach, say, the far right AF Point (a5: Focus point wrap-around). In order to work quickly or more efficiently, you should not only learn all the buttons and controls on the camera, but the D610 / D600 will allow you to customize them to fit your shooting needs and personal shooting style. Buttons like the Exposure Compensation and Metering Mode buttons on the top of the camera will obviously enable you to quickly change these settings. The AF Mode Button button, located inside the Focus Mode Selector switch near the base of the lens, may be confusing at first to those who have not previously seen or used it on the Nikon D7000, though you should quickly find that it is a convenient design. It is used to select the Autofocus Mode as well as the Autofocus AF-Area Mode. 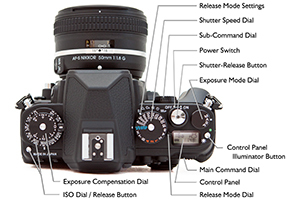 Press this button and turn the rear Main Command Dial to select the Focus Mode, such as AF-A or AF-C, while viewing the setting on the top Control Panel or in the Viewfinder. Press this button and turn the front Sub-Command Dial to set the AF-Area Mode, such as Single-Point AF or 39-Point Dynamic-Area AF, which you can also view on the top Control Panel or in the Viewfinder. View of the rear controls of the Nikon D600. The AE-L/AF-L Button can be customized to lock the exposure setting and/ or focus distance independently of the Shutter Button, or configured to perform back-button focusing duties. And buttons like the Fn Button and Preview Button can be set up to access one of numerous other settings that there is not a specific dedicated button for, such as quickly changing to Spot Metering or temporarily capturing RAW files while shooting in JPEG format. The Flash Button on the front of the camera will not only raise the flash, but it is also used in conjunction with the rear Main-Command Dial to set the Flash Mode (as viewed on the top LCD Control Panel), and with the front Sub-Command Dial to change the Flash Compensation amount. Some of the options for Custom Setting f2, to assign your desired function to the Fn Button. Unlike some other Nikon dSLR cameras, the D610 / D600 has separate settings for Interval Timer Shooting and Time-Lapse Photography Shooting. Although they are closely related – and are both methods of setting up the camera to automatically take photographs at regular, preset intervals – there are important differences. Interval Timer Shooting can be used to take a series of images at each interval (for example, four images in a row every 1 hour for 3 hours). It can be used to take these multiple series of shots over several minutes or hours. Time-Lapse Photography is used to take a series of individual photos at each interval over an extended period, which are then automatically combined into a time-lapse movie (for example, one photo every 30 seconds for 6 hours, which are then turned into a movie). The resulting movie will use the video frame rate you have set in the camera, and the menu will calculate and display how long the final movie will be based on your settings. If you are capturing images as JPEG files, you will want to set and/ or customize the Picture Controls so that your images have your desired level of sharpening, contrast, brightness, saturation, and hue. In other words, so that they look exactly how you want them to when they come out of the camera. These Picture Control settings are permanently applied to JPEG image files as they are processed and saved in the camera (but do not permanently affect RAW-NEF files). You can choose one of the presets such as Standard, Vivid, Landscape, and even black and white Monochrome. Or modify one of the presets to your desired settings or create your own custom Picture Control. You can even find custom Picture Controls online, such as ones that mimic certain types of film. Nikon D600 Picture Control menus to choose and modify a Picture Control, which determines the final look of JPEG images. Picture Control settings are not necessarily needed if you shoot in RAW. The Picture Control settings will be associated with the RAW file as metadata and may be “applied” as you view the image in processing software such as Nikon Capture or View NX 2, but the settings will not permanently affect the RAW file and they can be changed during processing without affecting the quality of the image. Although please note that the Picture Control you set applies to the images and their Histograms that you see on the rear LCD Monitor even if you are shooting in only RAW. So, for example, if you were to set a Picture Control with high contrast, the images shown on the LCD Monitor will incorporate this setting (and the Histogram will reflect this setting) and thus will not look the same as the “unprocessed” exposure captured in the RAW files that you will later view on your computer. Therefore you may want to have this set at Standard or Neutral if you shoot RAW so that the images and their histograms you view on the camera’s LCD Monitor closely resemble the actual unprocessed RAW images. Or you can take a different approach and customize the Picture Controls to closely resemble how you typically process your RAW files. That way you can preview on the rear LCD how your final, processed image will appear. This approach should be taken only after you have gained experience with post processing and have developed your own typical processing settings. Pressing the Exposure Compensation Button, indicated by (+/-), and turning the rear Main Command Dial will adjust Exposure Compensation, so that the exposure of a subsequent image is lighter or darker. If you wish to “cancel” exposure compensation, you will need to remember to change this setting back to zero after you take the shot. If you often make use of Exposure Compensation (EC), you may wish to sometimes apply EC to just the next shot but sometimes use it for all of your following shots. Custom Setting b3: Easy exposure compensation can give you very precise control over how you use the camera controls to set exposure compensation. You can set it up so that you must press the Exposure Compensation button as you turn the Main Command Dial in order to adjust exposure compensation. Or you can select to just directly turn the Command Dial of your choice, without pressing the Exposure Compensation Button first (by choosing setting On). This is a quicker way to adjust exposure compensation but introduces the possibility of changing it accidentally. With either of these above settings, exposure compensation will not be reset to 0 when you turn the camera off or when the metering standby timer period ends, so you must be sure to check your settings often to ensure you are not using exposure compensation when you don’t wish to. Custom Setting b3 to set up Easy Exposure Compensation. Alternately, you can set up the camera so that you turn one of the Command Dials (of your choice in Custom Setting f5) to directly adjust exposure compensation (EC), but your EC setting will be reset when the camera or exposure meter (Standby Timer) turns off. This option is the most sophisticated and most flexible, and may be the best one to learn and use. This is because you can still continue to use the Exposure Compensation Button with a Command Dial to set EC, but by setting it for On (Auto reset) EC will not be reset when the camera or Standby Timer turns off. Exposure compensation will only be automatically reset if you set it directly using the Command Dial without the button. So if you wish to use exposure compensation for just one shot, you can adjust EC with just the dial and then let it cancel after than single shot. But if you wish to take a series of shots with the same adjusted EC, you can use the button / dial combination to set it more “permanently.” Once you learn more about exposure compensation and how and when to use it, this will all start to make more sense, and you will begin to understand why this is such a powerful and useful Custom Setting. If you insert SD memory cards in both of the available slots, you can configure the second card to function in a variety of ways, by using the Role Played by Card in Slot 2 menu setting. Overflow will save your images onto the second card after the first card is full. Backup will simultaneously record copies of all images onto both card 1 and card 2. Raw Slot 1 – JPEG Slot 2 will store NEF (RAW) images on card 1 and JPEG images on card 2, for example when you are shooting NEF (RAW)+JPEG in order to capture both file formats at the same time. When the second or third option is selected, the camera will use the card with the least amount of remaining memory to determine the displayed amount of exposures remaining. In the Movie Settings Menu you can also select to save movies on a specific card. You can also use the Copy Image(s) menu item to copy images from one memory card to another when two cards are inserted in the camera. This can be used to back up specific images or the entire card at once. This could be useful to create back-up copies of your images when you don’t have access to your computer, external hard drive, or CD/DVD burner – but it is best to back them up on one of these more permanent devices as soon as possible. The in-camera HDR Shooting menu will allow you to select the exposure value (EV) increments of the two images (from 1 EV to 3 EV, or choose Auto), and you can also set the amount of Smoothing used when combining the images. You can set the camera to take just one HDR series, or continue to shoot in HDR Mode until you disable the function. Lowell House, Cambridge, Mass – Making use of in-camera HDR to obtain a better exposure at night, with broader range of light, dark, and shadow details than would be possible with a normal exposure. Multiple Exposure image taken with the D600 using Multiple Exposure Shooting mode. With the D610 / D600, Custom Setting b4: Center-weighted area gives you the ability to customize the size of the central area that is used in determination proper exposure when working in Center-Weighted Area metering mode. When using Center-Weighted Metering the camera looks at the entire frame to determine exposure, but adds extra “weight” to the exposure values of the central area of the frame. You can choose the desired diameter of the central circle area: 8mm, 12mm, 15mm, or 20mm. Or you can choose for the camera to determine the Average exposure of the entire frame, with setting Avg. This option should be set based on how precise you wish your metered area to be or based on the size of the subject that you are metering. Since you can use Spot Metering mode for very precise metering of a 4mm diameter spot when you need that, perhaps it is useful to leave this at the default 12mm (though note that the 4mm Spot Metering circle moves and is centered around the active AF Point, while the Center-Weighted circle does not move). You can also set this to Avg to average the entire scene. This is a far less sophisticated mode of evaluating the entire scene than Matrix Metering (which takes the selected Focus Point and other data into consideration), and is similar to using an old film camera that averages the entire scene to 18% grey to determine proper exposure. Simulated view of the Nikon D610 / D600 Viewfinder, showing the location of the AF Points, the approximate sizes of the Center-Weighted Metering area size options, and the optional grid. The 4mm circle is the size of the Spot Metering area, which will actually move based on the active AF Point. You can also take advantage of Custom Setting b5: Fine-tune optimal exposure to fine-tune the exposure value that is selected by the camera in each of its various metering modes. If you find that your images are always typically being slightly underexposed or overexposed when using a specific metering mode, you can adjust this accordingly so that you don’t have to use exposure compensation every time you use that metering mode. For example, you may find that Center-Weighted Metering delivers great exposures, but you would prefer that the images taken with Matrix Metering were 1/3 EV (1/3 step) overexposed all the time. If that is the case, you would adjust Matrix metering to +2/6 using the Custom Setting b5 menu. If you make use of this adjustment, you can still use exposure compensation in any situation in addition to this fine-tune adjustment. The fine-tune adjustment of Custom Setting b5 will happen “behind the scenes” to adjust the baseline exposure prior to any exposure compensation adjustment. You can use the menu item for ISO Sensitivity Settings to do much more than simply changing the ISO setting (which is more easily done simply using the ISO Button on the camera). If you plan to use Auto ISO rather than selecting your own ISO setting, this menu is also used to set the optional Auto ISO Sensitivity Control, which will function in P, S, A, and M shooting modes. Making use of Auto ISO can allow you to concentrate more closely on your aperture or shutter speed settings, and of course on your composition and framing. And the D600 has some great options that make the use of Auto ISO more viable and appealing than previous cameras. Nikon D610 / D600 ISO Sensitivity Settings Menu, including Auto ISO. If you enable Auto ISO then the camera will automatically change your selected ISO, without your expressed permission, in certain situations in order to obtain a proper exposure. For example, if you are working in Aperture-Priority Auto Mode (A) and set the ISO at 1600, but based on your selected aperture and the lighting the camera does not believe there is enough light for the exposure and a realistic shutter speed (that you also set in this menu item – see below), it will automatically raise the ISO so that the shutter speed does not become impossibly slow for hand-holding. This may be good if you are still getting used to the cameras controls and settings and wish for the camera to help you out a bit in certain situations where you may not be paying close enough attention to your settings. Or perhaps in situations such as at a concert where the lighting may change dramatically without you realizing it or responding fast enough. But if you want complete control of your settings and exposures, you will need to turn this Off. If you do set Auto ISO Sensitivity Control to be On, then you also set the Maximum Sensitivity or maximum ISO that the camera will use in these situations. For example, you may wish to set it no higher than 3200 or perhaps 6400 if you are willing to accept the digital noise of photos at that high an ISO. You also set the Minimum Shutter Speed that you would like the camera to automatically use in these situations. I suggest you set it at the slowest shutter speed you can possibly hand-hold and still potentially get an image without blur, perhaps 1/30 at the slowest if you are careful. One of the powerful features of Auto ISO with the D600 is that when using it, the camera selects an ISO setting based on the local length of the lens being used. If you find that, when using Auto ISO, the camera is selecting shutter speeds that are slower than you wish (and thus may cause blur due to camera-shake), you can use this menu to adjust these settings and instruct the camera to use a faster shutter speed. You will likely want to enable most or all of the Playback Display Options so that you can better evaluate your images, their settings, and the resulting exposures. That way you will know how to adjust the camera settings for the subsequent images. When these various display options are enabled, you can view the different screens during full-screen image playback (not multiple thumbnail view) by pressing up or down on the Multi Selector. Playback Display Options menu screen of the D610 / D600. On the menu screen shown above, None will display a full screen image with no information, which helps you to inspect the image. Highlights will display blinking areas to alert you of where the image has been overexposed, which can help you determine the proper exposure for the subsequent shots. RGB histogram will display histogram graphs of the various color channels to also assist you in determining proper exposure. This one may actually be optional if you do not yet make use of individual color channel histograms. Shooting data displays additional information including the lens and focal length used, flash information, and Picture Controls settings. This screen is not necessarily very informative immediately after taking the shot since you already know most of these settings, but can be handy when later reviewing an image in-camera. Overview displays a thumbnail of the image along with the RGB histogram and shooting information. This is perhaps the most important and useful information screen to use while shooting to help determine that you obtained the proper or desired exposure of an image. The option for Focus point will show you which Focus Point was used when capturing an image, and will thus verify if you properly focused where you intended (unless you recomposed after locking focus). It is that tiny red square or squares superimposed on your image when you view it on the rear LCD Monitor, but will not be on the actual image. It is most helpful for when you let the camera select the autofocus point, such as in action situations, and/ or when using an AF-Area Mode other than Single Point AF – and then you can see if the camera focused where you wished. But if you manually select your own AF point, as you typically should in many situations, you will already know where the camera focused. Overview Playback Display option, which shows a thumbnail of the image along with the RGB histogram and shooting information. The Histogram is used to help you determine if your image was under- or over-exposed, and you generally want to make sure the graph falls down to zero before it reaches the edges of the histogram chart. If the data runs off the right side or spikes against the right edge, it means that you have over-exposed areas of your image, and you will need to adjust your exposure settings or make use of Exposure Compensation for taking the subsequent image. Purchasing the Nikon D610: If you are still contemplating the D610 and plan to buy, please consider using my affiliate links to make your purchase, and the retailer will give me a little something for referring you – thanks! You can click on the Amazon, B&H, or Adorama logos on the left of this page, or click here for the Nikon D610 on Amazon. This instant download Nikon D5100 e book is for those who wish to get more out of their camera and to go beyond Auto and Program modes and shoot in A mode and S mode. To get you started, it includes explanations and recommended settings for all Playback, Shooting, and Setup Menus, Custom Settings, and Movie Mode settings of the D5100. It covers basic dSLR camera functions and exposure concepts for those new to digital SLR photography, and explains more advanced camera controls and operation, such as using the various metering modes and exposure compensation for correct exposure of every image, controlling autofocus modes and focus points for sharp focus of still or moving subjects, and utilizing dramatic depth of field for professional looking photographs. This guide builds on the information provided in the manuals and explains essential settings and information to help you get out there shooting in the real world. You can preview Nikon D5100 Experience at the following link. The preview shows the Table of Contents and Introduction, a sample D5100 Menu Settings page, a sample Custom Settings page, and a sample text page. Setting Up Your D5100 – All of the D5100 Custom Settings and Playback, Shooting, and Setup Menus, with brief descriptions and recommended settings for practical, everyday use. Set up and customize the advanced features of your dSLR to work best for the way you photograph. Aperture Priority Mode (A) and Shutter Priority Mode (S) – How and when to use them to create dramatic depth of field or to freeze or express motion. Auto Focusing Modes and Area Modes and Release (Drive) Modes – How they differ, how and when to use them to capture sharp images of both still and moving subjects. Also how and when to use focus lock. Exposure Metering Modes of the Nikon D5100 – How they differ, how and when to use them for correct exposures in every situation. Also how to make use of exposure lock. Photography Accessories – The most useful accessories for day-to-day and travel photography including accessories specific to the D5100. This digital guide to the Nikon D5100 is a 70 page, illustrated PDF document that expands upon the information found in the D5100 manuals, to help one begin to master their dSLR and learn to use the Nikon D5100 to its full capabilities! It is packed with helpful information applicable to the new and intermediate dSLR photographer – to begin to turn you into an advanced digital photographer! Format: PDF – Instant Download – read on your computer, print on your printer, transfer to your iPad, Android, or other tablet, transfer to your Kindle, Nook or other e-reader. The iPad and iPhone version is available through Apple’s iTunes or through the iBooks App on your mobile device. I read it from front to back in one sitting, playing with the camera as I went along, and I found it covered all the major things I was having trouble with. It left me much more confident about focusing and exposure issues particularly. If you are new to DSLRs or want to bypass hours of hunting through manuals, this is great. There are many sensible real-world suggestions for configuring the camera that are very helpful, the author writes clearly and concisely, and his approach is accessible and friendly. If you’re having trouble getting going with your new camera, I think this is well worth it. Great manual! This book made it much easier to operate my new Nikon D5100. It basically expands on the manual that comes with the camera and tells you what each setting is and what you should set it at. It also gave me some great pointers on Aperture priority mode, Shutter and ISO. Highly recommended! From beginners to experienced users: This guide is very useful for beginners to experienced users. When you buy this kind of camera you want to understand the best ways to freeze moments which is exactly explained in this book. This book is written in a human way by an experienced photographer who gives you the tips you need to create a beautiful picture – how to prepare your camera, create shortcuts, or activate such options to make you efficient in the field. I would recommend this e-book to every new Nikon D5100 buyer! I found the Nikon manual good for understanding how to set things up but not much on the why – this book really focuses on the “why.” I would like to thank you for saving me time – now I’m confident that my camera is well tuned! I’ve spent a significant amount of time with the new Nikon D7000 as I was researching and writing my ebook user’s guide Nikon D7000 Experience. It has been interesting to contrast it with the recent Canon 60D, as they sit in a somewhat similar position in each brand’s current dSLR line-up. They are both excellent cameras and are both highly customizable for you to set up for the way you shoot. But I have to say I’m incredibly impressed with the higher amount of customization options offered by the D7000. Nikon offers the opportunity for advanced shooters to fine-tune many settings of the D7000 – options that the 60D just doesn’t have. White Balance – many more fluorescent options and the ability to tweek any of the WB settings along the blue-amber and green-magenta axes – including the ability to make blue-amber adjustments on the fly without going into the menus by using the WB button. The 60D not only doesn’t offer this level of adjustment, it doesn’t even have a WB button on the body of the camera. Frame Rate – The Continuous Low release (drive) mode can be set for between 1 to 5 fps. Canon only offers 3fps in Low Speed Continuous. This is not such a big deal on the 60D because High Speed Continuous is 5.3 fps. However with the Canon 7D, this would have been an incredibly helpful option. The 8 fps of High Speed is blazing fast, typically too fast for real life use as the scene barely changes from image to image yet the large files can quickly fill up a card. But then 3 fps is too slow for action use. I have long wished for a 5 or 6 fps option on the 7D. Metering – With the D7000 you can change the size of the area metered in Center-Weighted Area metering mode if you wish for more or less precision or if you are working with a subject of a particular size. The camera can be set to meter a circle of various sizes: 6mm, 8mm, 10mm, 13mm, or even an average of the entire scene (Average will act like a very dumbed down Matrix (Evaluative) Metering and just average the entire frame and not take selected AF points into consideration). The 60D does not offer this ability but does offer Center Weighted metering mode and Partial metering mode (which meters a center circle that is 6.5% of the viewfinder). Both cameras offer Spot Metering for very precise metering. Exposure – In the D7000 you can fine tune the default settings of each of the metering modes to slightly under- or over-expose. This is an adjustment done behind the scenes and not exposure compensation. This is something I would find very handy on my 50D because it always overexposes by about 1/3 a stop in Evaluative Metering mode. So instead of using -1/3 exposure compensation all the time, I finally settled on using Center Weighted Average metering. But with the D7000, you can fine tune the camera to always underexpose. For example if you were to have this slight overexposure problem in Matrix metering, you could fine-tune Matrix for -1/3 and then it would be fixed. You could use exposure compensation on top of that when necessary. You can also customize the controls for exposure compensation (EC) so that your EC adjustment applies to only the next photo taken or to all subsequent photos. So as you can see, the D7000 offers many advanced customization and fine-tune options in the Menus and Custom Settings that the 60D just doesn’t offer. Keep in mind however that these are pretty advanced features, and if you are not going to be making use of them, don’t be swayed by them when choosing a camera. For a more detailed comparison of these two cameras, see my post Nikon D7000 vs. Canon 60D. In these books I cover all of the menus and custom settings, along with their recommended settings for general photography and travel photography use. These kinds of settings are what make these cameras very powerful and precise tools that you can – and should – set up to work for the way you photograph. They are worth learning, understanding and making use of. If you wish to compare the Canon 60D with the other Canon dSLRs, see this post Canon 5D vs. 7D vs. 60D vs. 550D/T2i and if you wish to compare the Nikon D7000 with the other Nikon dSLRs, see this post Nikon D7000 vs. D90 vs. D300s. Setting Up Your D7000 – All of the D7000 Custom Settings and Shooting, Setup, and Playback Menu settings, including movie mode menus, with brief descriptions and recommended settings for practical, everyday use. Set up and customize the powerful advanced features of your dSLR to work best for the way you photograph. Exposure Metering Modes of the Nikon D7000 – How they differ, how and when to use them for correct exposures in every situation. Also how to make use of exposure lock. Photography Accessories – The most useful accessories for day-to-day and travel photography. This digital guide to the Nikon D7000 is a 63 page PDF document (also available in Kindle and Nook formats) that builds upon the information found in the D7000 manual, to help one begin to master their dSLR and learn to use the Nikon D7000 to its full capabilities. The guide cuts through all the information thrown at you in the manual and focuses on essential settings and information to help you get out there shooting in the real world. It is packed with helpful information applicable to the new and intermediate dSLR photographer – to begin to turn you into an advanced digital photographer! View a preview of it here. The preview shows the table of contents, a bit of the intro, a page of the Menu Settings, a page of the Custom Settings, and a couple text pages. This version is a PDF format e-book, 8.5″x11″, which can be read on your computer screen, printed on your printer, taken with you on your laptop, and can also be read on the iPad, Android or other tablets, Kindle, Nook, or other e-readers. 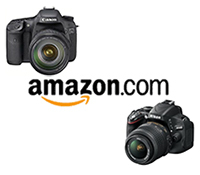 See and buy your D7000 on Amazon and help support this blog! Your World 60D Menus and Custom Functions – A Mini-Guide to the Menu Settings, Movie Mode Menu Settings, and Custom Function Settings of the Canon EOS 60D is my new eBook guide for setting up the Menus, Movie Shooting Mode Menus, and Custom Function settings of the Canon EOS 60D. Several weeks ago when the Canon 60D came out, I started to put together a blog post on explaining and setting up the 60D Custom Functions and Menu settings. I got a bit carried away because each item led to a more in-depth explanation of exposure or metering modes or auto focus points. So that post turned into a entire guide, which became my first eBook, Your World 60D (a bestseller on the Amazon Kindle store, also available in PDF format here on this blog or for the Barnes and Noble Nook e-reader). But I realize that a lot of people are just interested in the Custom Functions (C.Fn) of the EOS 60D, and how to set up all the menus and options, and don’t necessarily want the entire guide. So I excerpted that part of the eBook right back out, and created a mini-guide – Your World 60D Menus and Custom Functions. It has over 15 text only pages of the Menu Settings, Movie / Video Mode Menu Settings, and Custom Function Settings, with brief explanations of what they are, what they do, and recommended settings for general and travel photography. This text only guide will help you set up your EOS 60D, quickly and competently, and is intended for those new to digital SLR cameras as well as intermediate users. As you have figured out by now, the Canon 60D is an advanced tool, and this mini-guide explains how to set it up in order to begin to use it to its full potential. Taking control of its settings will help you to take control of your camera, the image taking process, and the photos you create. It is an instant download eBook mini-guide which consists of an important section taken from the full version of Your World 60D. It contains every Menu setting and Custom Function setting, with brief descriptions and recommended settings to get you up and running quickly, and includes Movie Mode menu settings and My Menu. The Canon EOS 60D Custom Functions (C.Fn) and Menu settings are a big part of what make it such a powerful digital SLR camera. This guide can save you time and help you better understand and control your camera as you set up and customize the Canon EOS 60D to work best for the way you photograph. Your World 60D Menus and Custom Functions is a text-only PDF document that builds upon the information found in the Canon 60D manual, to help you begin to master your dSLR and learn to use the Canon EOS 60D to its full capabilities! If you decide to purchase the full version of Your World 60D after reading this mini-guide, you can buy it at a $4 discount using the Coupon Code you will receive when you order and download the mini-guide.